A new device that hooks up to a smartphone will enable it to double as a u2018premium camerau2019, claims its maker, Sony. There are two QX devices that Sony describes as ‘lens-style cameras’, featuring a built-in imaging sensor, shutter button, image processor, battery and memory-card slot. The first is called the Cyber-shot DSC-QX10, which houses an 18.2-million-pixel, 1/2.3in-type Exmor R CMOS imaging sensor and a 10x Sony G lens designed to produce the 35mm equivalent of a 25-250mm zoom. It will cost around £179. The second is the Cyber-shot DSC-QX100 (pictured), priced £399. Aimed at enthusiasts, it features a 1in-type sensor (the same 13.2×8.8mm, 20.2-million-pixel unit as found in the Sony Cyber-shot DSC-RX100), plus manual focus control and a f/1.8 Carl Zeiss Vario-Sonnar T* zoom (28-100mm equivalent) zoom lens. Sony claims that both devices, which clip on to a smartphone and connect via Wi-Fi, can work up to 10m away from the device they are paired with – allowing the user to take shots using their phone and to use its touchscreen as a remote viewfinder. Images can be saved to the memory card, the phone, or both. Neither device will capture raw image files, however. 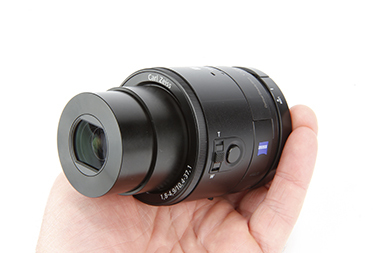 The QX10 and QX100 – due out at the end of September/start of October – are designed to fit smartphones measuring 54x75x13mm and are Android or Apple iOS system compatible, according to Sony. To coincide with the launches, Sony says it will launch a new Play Memories software application that enables the phone to simulate the interface of a camera. This means users should be able to control settings such as exposure compensation and aperture, and share images via apps installed on the smartphone. ‘Everything is easily accessible, with extra dedicated keys or fingertip control of zoom and shutter release on the camera body,’ claims Sony. The QX10 and QX100 are also compatible with Near Field Communication, a wireless system designed to allow ‘one-touch’ connection between devices. While the company expects the QX100 to hit sales of compact cameras, Sony UK’s head of digital imaging Frederik Lange does not see it affecting sales of high-end compacts that have a built-in viewfinder and grip. If anything, he sees the new gadgets as ‘bringing people into photography’.